Nintendo released the details of the forthcoming 3DS handheld line-up earlier today, with a number of games from some of its key third party developer and publisher partners on the list. 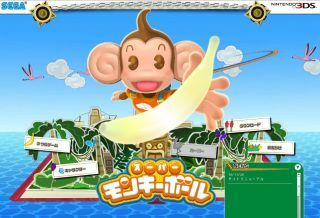 One such game was Sega's sublime Super Monkey Ball , appearing in 3D for the very first time on Nintendo's new handheld. The 3DS arrives in the UK on 25 March, with many retailers promising a launch price a shade under £200. "Being able to use the new technology that the Nintendo 3DS has to offer is a great step forward for the Super Monkey Ball franchise. "The unique 3D screen really brings a new found depth to the gameplay experience, engaging the player more-so with the variety of characters and worlds on offer. "Players also have a choice of either the Circle Pad or the internal gyroscope as control options for complete precision, meaning that everyone's preferences are catered for in Super Monkey Ball 3D." Well. We'll be the judge of that when we get our hands on the game next month. Luckily (for gamers and Nintendo fans) Sega has plenty of competition at launch, with games such as Pilotwings Resort, Street Fighter IV 3D edition, Sims 2, PES 2011 3D, Lego Star Wars III: The Clone Wars, Ridge Racer 3D, Samurai Warriors: Chronicles, Asphalt, Splinter Cell 3D and Rayman 3D all in the 25 March line-up.